This week was Invasive Species Week at Surrey Wildlife Trust. But I should tell you first what an “invasive” species is! In their most common definition (here is DEFRA one), these are “non-native plants or animals, which have the ability to spread causing damage to the environment, the economy, our health and the way we live.” There are many non-native plants and insects, introduced voluntarily (like many of our garden plants, vegetables etc!) or involuntarily (mostly through air or water transport)….but only a minority of these non-native species become invasive! 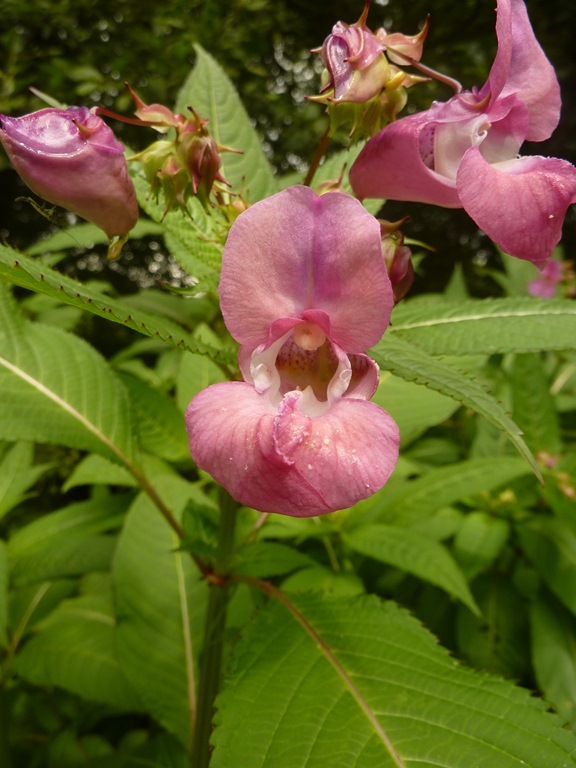 This special week focused on Himalayan Balsam (Impatiens glandulifera), a lovely-looking pest. Introduced in the 19th century as a garden plant, it has spread all over Europe and has taken over river banks and other damp habitats. It can grow up to 3 meters, with strong stems and clever roots. 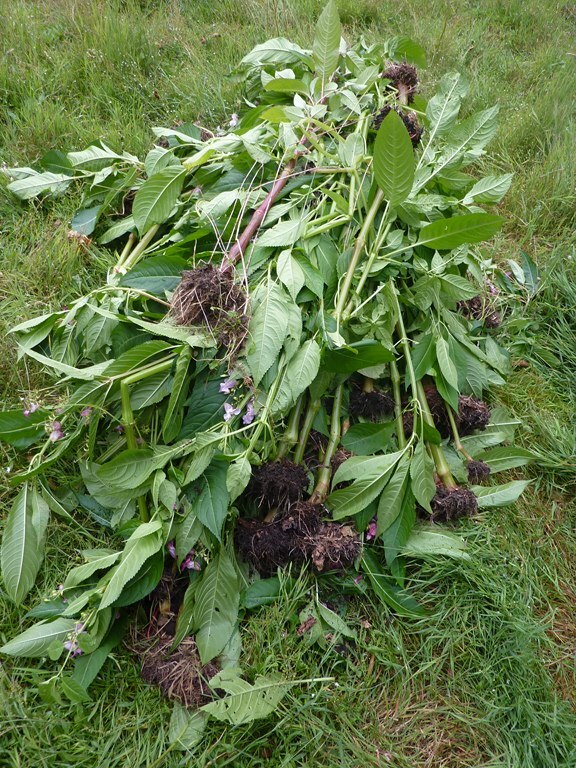 Himalayan balsam is thought to increase the risk of floods (when it dies in late autumn, it leaves the soil bare, which increases run-off) so it has been considered seriously by authorities. The most efficient way of tackling it is hand pulling, so volunteers all over the country have a hard job! 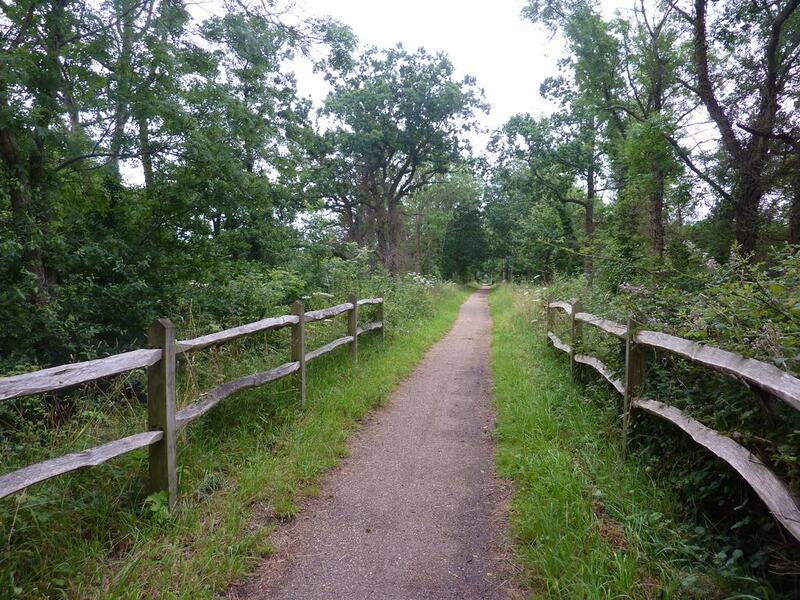 The first site where I volunteered is located near Stonebridge Wharf, Shalford. We arrived in a tall-grass fen, which has Himalayan Balsam on its edges. 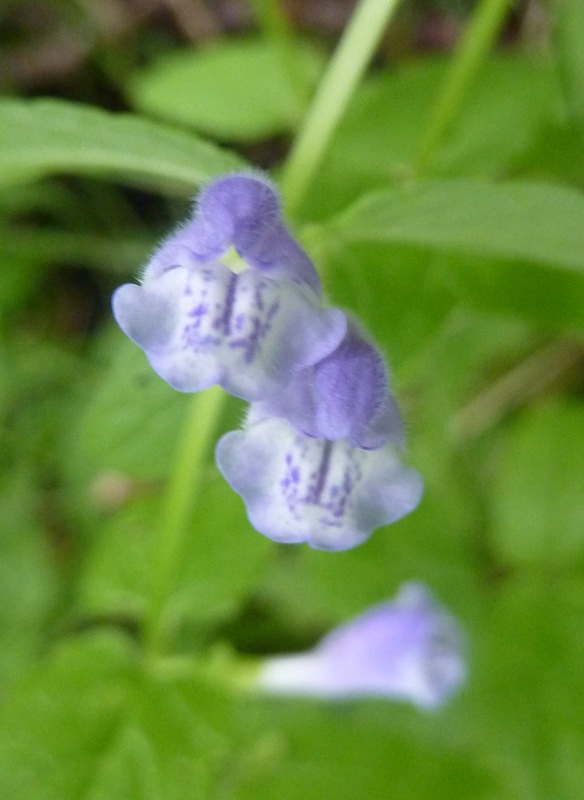 A new (and cute) plant for me : Scutellaria galericulata (Skullcap)….and piles of pulled-out balsam (feels good :D). We moved towards the river, pulling Himalayan Balsam in ditches on our way. I can’t resist showing you this Beautiful Demoiselle (yes, that’s its name!). I’ve never seen any in France or Belgium, but they seem pretty common around here! 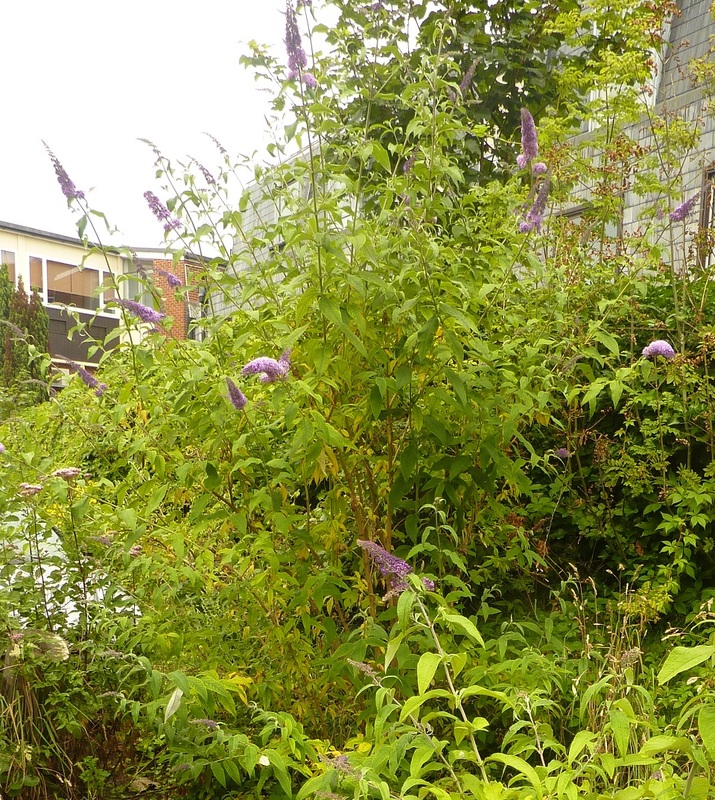 First invasive spotted : Buddleia (Buddleja davidii), a wonderful garden shrub attracting butterflies…but also rapidly spreading. 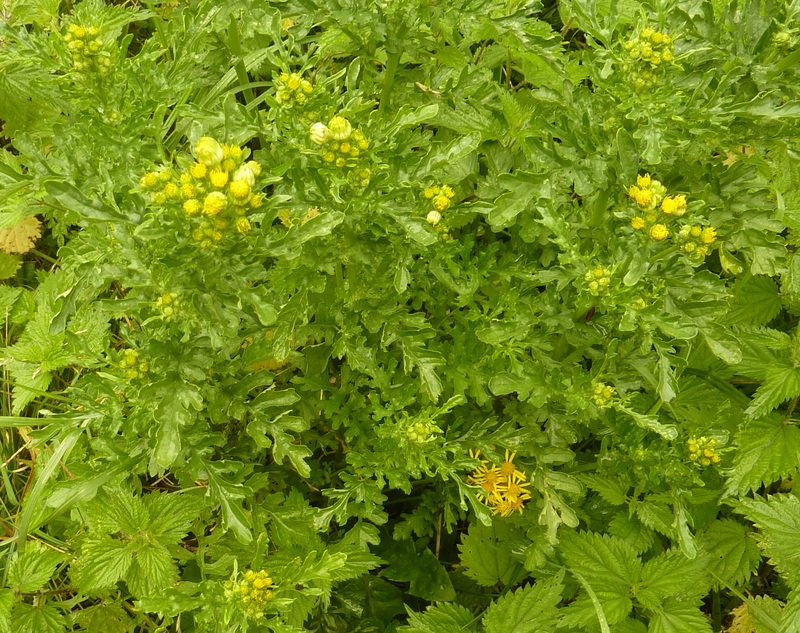 Then comes Ragwort (Senecio jacobaea), widespread, and even nastier because it is poisonous for animals. 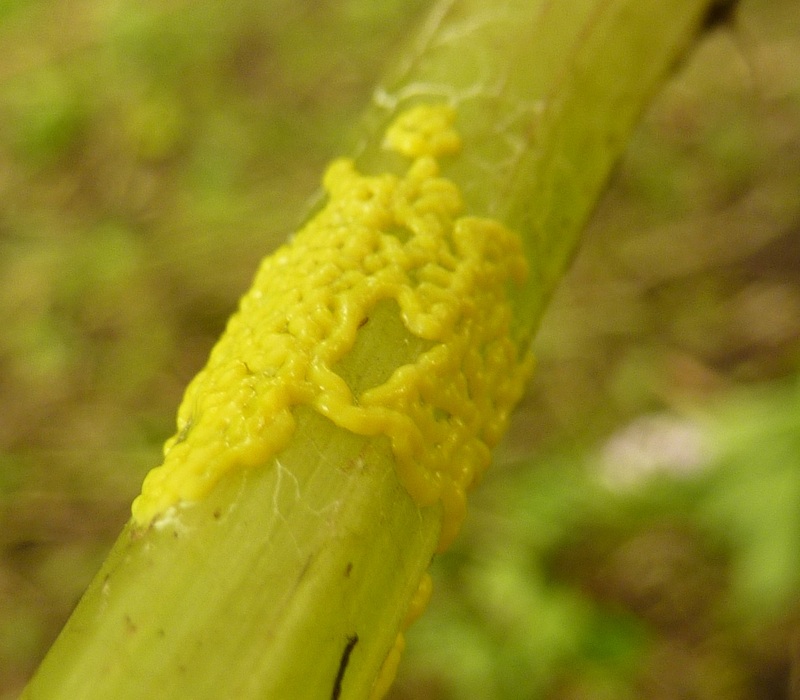 Plants aren’t the only non-native invasives in the UK. A well-known insect example is the Harlequin Ladybird (here you have two different colour forms of the same species, tricky! 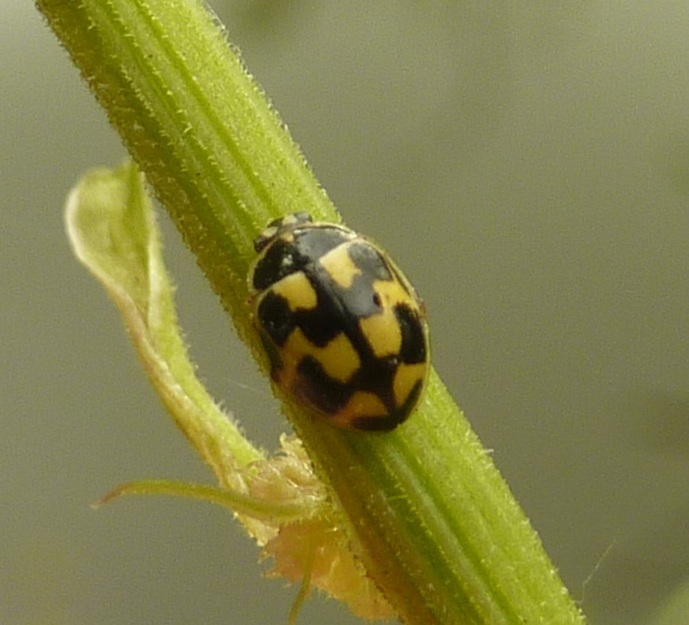 : Harmonia axyridis spectabilis and succinea) which is detrimental to native species like this very small 14-spotted ladybird (Propylea quatuordecimpunctata). 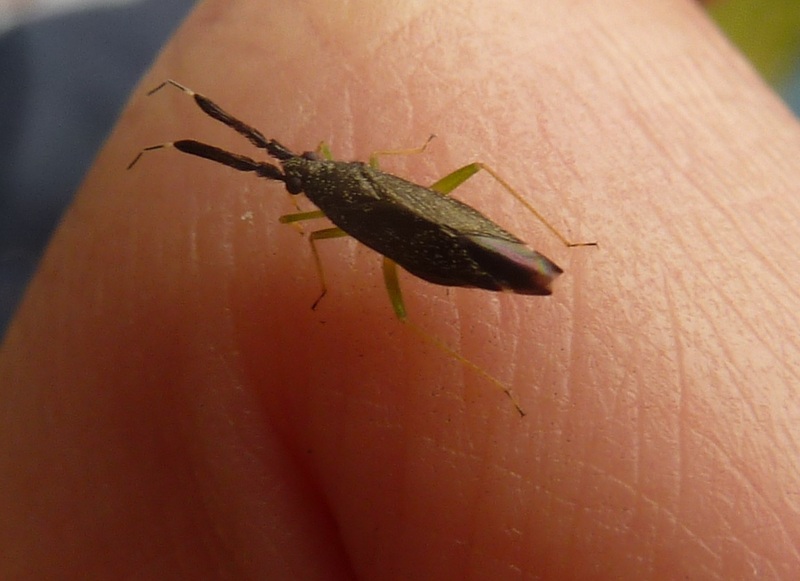 A bit of non-invasive insect recording with a mirid bug, Heterotoma planicornis (pretty distinctive, with its flattened antennae and bright green legs). I can’t help but finding this weird bug cute. 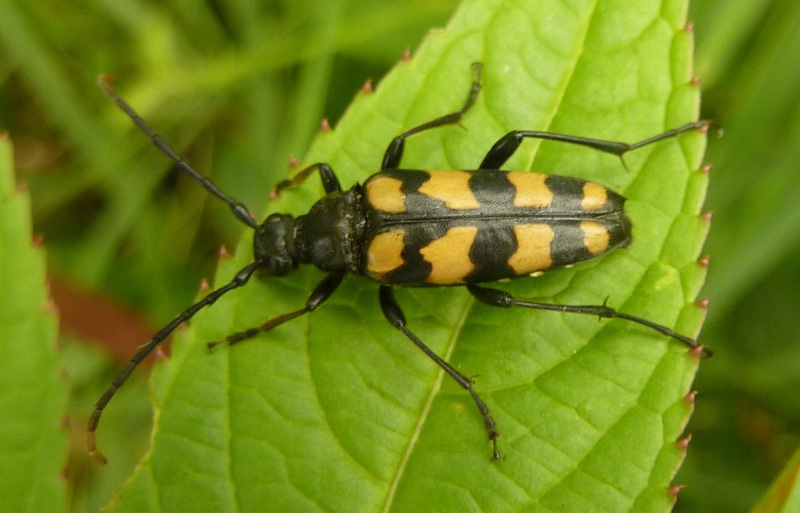 😆 On Himalayan Balsam (damn), a common longhorn beetle, Leptura quadrifasciata. For once, an easy-to-ID species, with orange markings. In the afternoon, we did more Balsam pulling around a lovely pond. 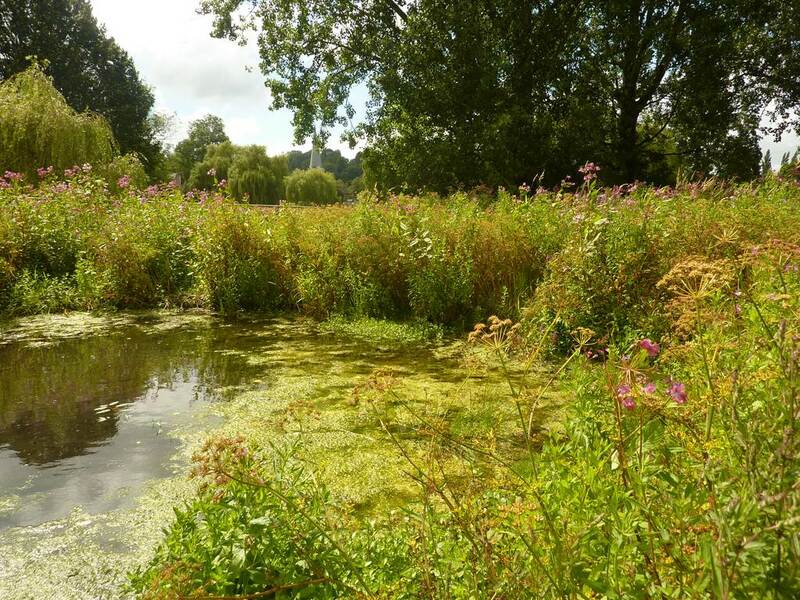 Himalayan Balsams have grown so high there that they form a thick cover, and deprive smaller native wetland plants (like Water Forget-me-not, Purple loosestrife or Brooklime) of light. Hopefully the pulling will have a positive effect, and allow native plants to grow better, at least for this year! While pulling balsam, I noticed this plant, looking strangely like a small version of Himalayan Balsam, but with weaker stems, and orange-red flowers. It is Orange Balsam (Impatiens capensis), a north-american relative, also introduced as a garden plant. 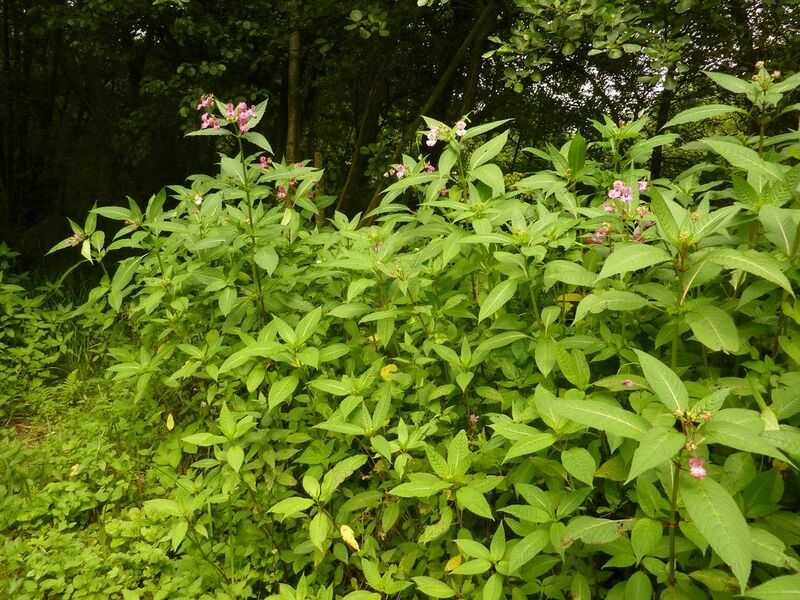 It has spread widely in the UK, and must be watched, but it’s certainly not considered as invasive as its cousin Himalayan Balsam. Cool pictures! That Beautiful Demoiselle is extremely lovely! I have heard of Dog Sick but never seen it. Last year I came upon an interesting bright orange fungus, shaped like a squid. I touched it and afterwards my fingers smelled awful. Later googled “stinky squid mushroom” only to find it’s actually called Stinky Squid. I love fungus names. 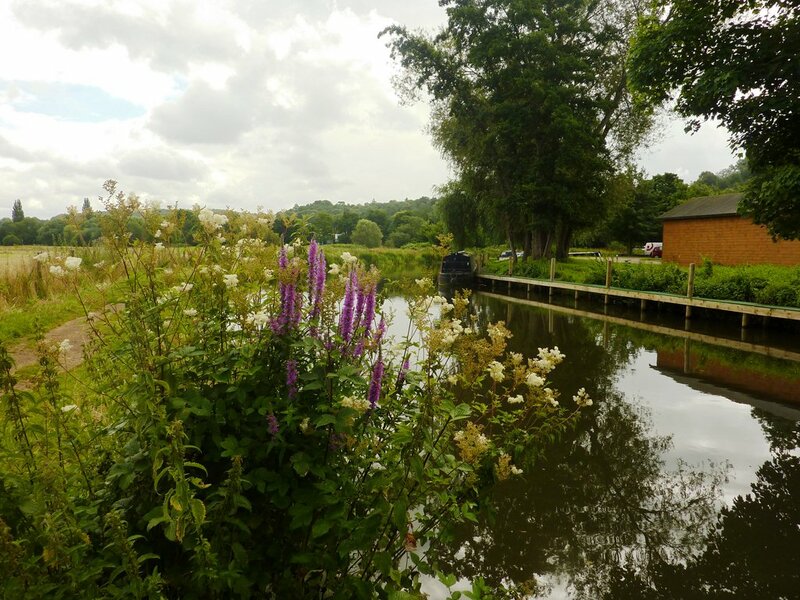 In the view of the River Wey photo, is that purple loosestrife I see? Such a gorgeous flower, but unfortunately very invasive here on the other side of the Atlantic. Thanks for your kind comment! 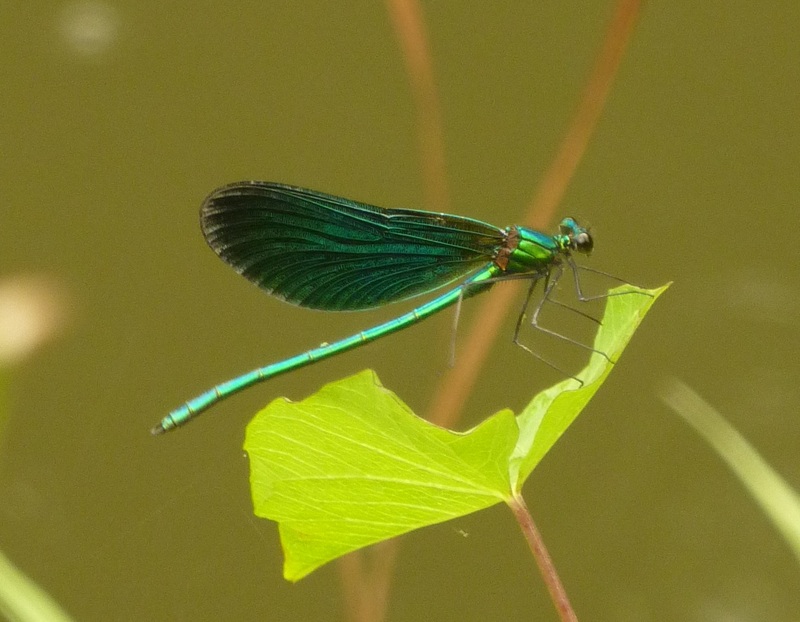 We also have the “Banded Demoiselle” here (which has a dark band on the wing), hope I can post a picture soon. I looked at your “Stinky Squid” out of curiosity, what a striking fungus. 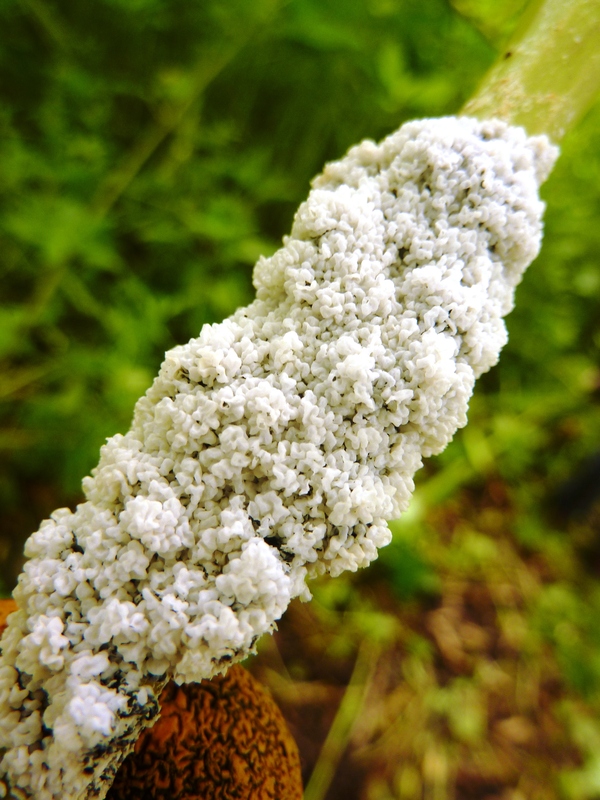 It belongs to the same family as stinkhorns, so no wonder it had a strong smell! 😀 “Earthstars” are on my list of fungi I would like to see, they look so innocent. On the pictures, it’s indeed Purple Loosestrife, it grows quite well along the river Wey and in the wetlands around. 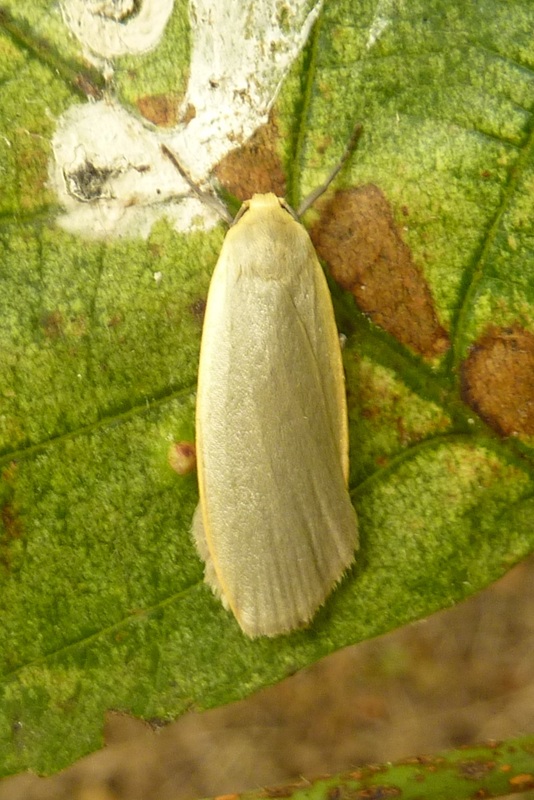 I think the species is declining in the UK…which is rather surprising when you know how easily it has invaded the US! Thanks 😉 How do you tell between the Dingy and Common one? I’m completely new to moths, and I have to admit it’s quite fascinating how moth-ers can distinguish so easily between similar species! That’s an amazing weevil, isn’t it? I would love to take a video of the female in action, but it must be quite uncommon to spot it. 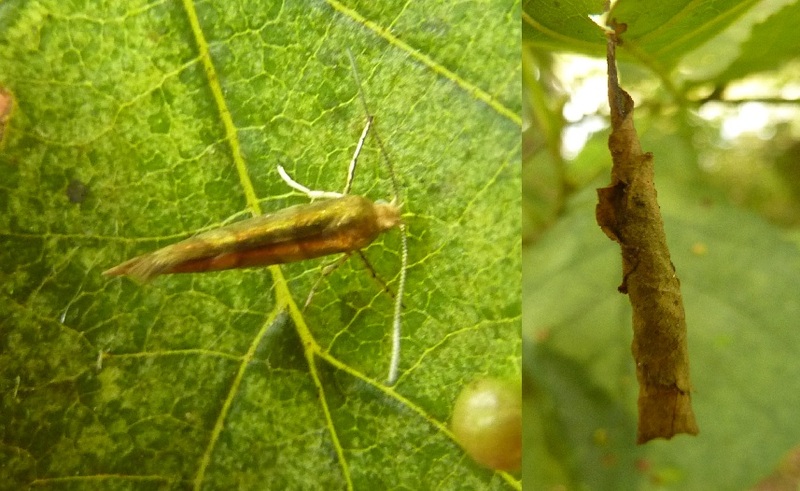 I’ve posted the micro on WAB forum, they seem to agree with Argyresthia goedartella, I just need to update the post. I am an iSpot user, but I’m more of an helper…I should post more of my pictures, just being a bit lazy here 😉 It’s a really great project and website!